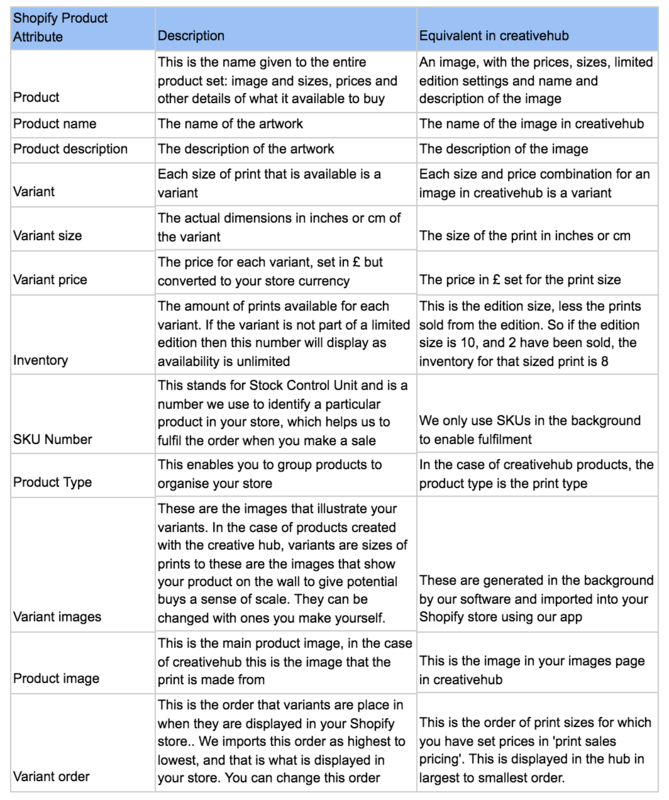 Understanding Shopify and creativehub product terminology and the fields for edit in each. When you set prices for the prints you want to sell in your creativehub account, the moment you save those prices they will import as products into Shopify, where they will appear in your products list. Some of the fields above can then be edited if you wish in your Shopify store. Some of them however are fixed, in the sense that if you try to edit them, we will automatically return them to their correct values. Some of them can be edited but we advise strongly against this. You can expand the description and use your own tone of voice. You can add your own variant images that fit your store’s style. You can put the price up in Shopify. However, if you want to put it down, you have to do it in your creativehub account. We have gone for largest to smallest, but you may want to change that order and our system will let you do that. You should edit this in your creativehub account, or if the image has been acquired from the Art Catalogue and you are selling on behalf of another artist, you should stick with the name they gave the artwork. We let you put the price up in Shopify, but the price cannot be lower in Shopify than it is on the creativehub, so if you put the price down below what it has been priced at on the creativehub, we will change it back to the price that is set in creativehub. This is because if you are selling other artist’s works acquired from the Art Catalogue, those artists do not want their work appearing on sale for less than they have set it as. This means you can charge more for it, but they have effectively set a minimum price. If you want to change this, please do it in the creativehub. If you change it in Shopify, we will immediately change it back to the size stored in your creativehub account. This is because the size that we will print it at is the one saved and stored on creativehub. This is the type of art print. Again If you change it in Shopify, we will immediately change it back to the art print type stored in your creativehub account, because that is how we will print it and we want your products in your store to be accurately described. This is just our way of identifying your product, there is no need for you to change it and it does not appear in your store. if you change it then we will immediately revert it back to the original. If you want to reset any changes you have made in your Shopify store and revert the product back to how it appears in creativehub, just delete it from your Shopify product list. It will be reimported immediately exactly as it appears in the creativehub. This will reset any edits you made in Shopify. Due to the above, we advise that where you can, you make changes in creativehub to things like prices, descriptions, product names etc. This means that you have a master version of how you want your art print to appear in a Shopify store saved in your creativehub account. This, for example, means you could also share that in your creativehub account and sell it through other peoples stores and then it will also appear in their stores exactly how you want it to.